Love the vintage. Where did you get them from, and were you happy with their condition? 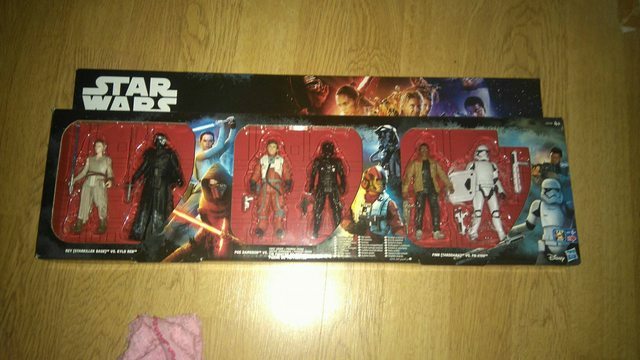 I ordered figures from Disney once and the cardbacks were bent. I bought them from Kapow Toys, got them for £69.99 on pre order, came in perfect condition. The card is a bit thinner than the earlier VC, plus the bubbles are bigger but it does not bother me. The only thing I wish was different is they come punched and have two bit of tape on the edge of the bubbles. Still think they are excellent. Picked this one up today. I have sold him twice and regretted it. Definitely one of the greatest Star Wars figs. Need to get a loose one now. Nice vintage figures 2018 - I am not collecting these but they do look great. Will have some new Star Wars figures soon to show you guys. My final pick up from TRU today was another Rose. Taffius wrote: My final pick up from TRU today was another Rose. You poor man I feel really sorry for you. Picking up rose is not a glamorous job but someone has to do it. I remember picking up two thinking it would be a neat character. Then I watched the movie. I couldnt leave her there with her 30 mates! Taffius wrote: :lol: I couldnt leave her there with her 30 mates! You should have bought all of them and make an army of a really poorly written character. Weirdly enough I haven’t seen a single rose around my stores for a while. Picked these up really cheap at an estate sale on Saturday. Figures only cost quarter each which I don’t think is too bad. It was odd as other stores had loads of other figures that were not Rose. Taffius wrote: It was odd as other stores had loads of other figures that were not Rose. I've seen some people have over a dozen of rose in one store followed by gen. Hux. Not bad figures though. Mrleemur wrote: I love that Annie helmet!! Thanks. It's a pretty nice Don Post helmet. Was very dirty but I got it cleaned up. Not bad for $5.